SCVHistory.com LW3023 | William S. Hart | Hart and Chief Standing Bear in Los Angeles, 1926. 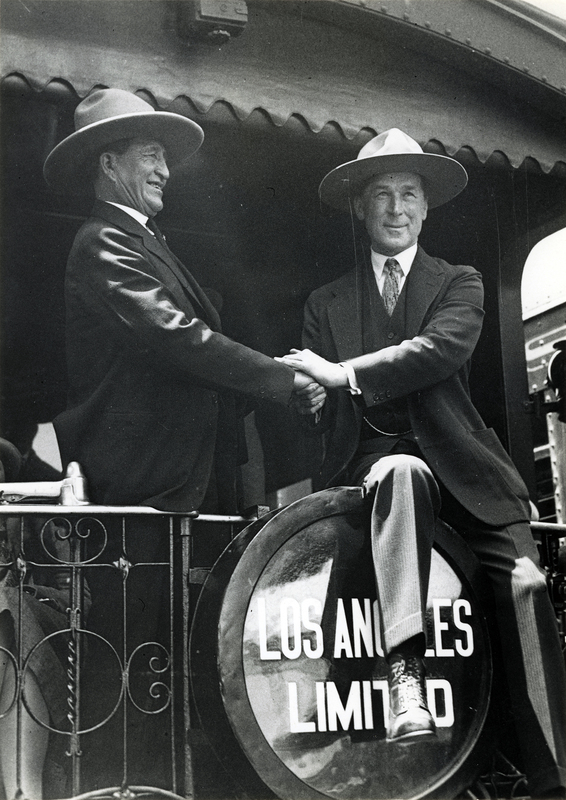 Los Angeles, Calif. — William S. Hart (right), pioneer Western motion picture star, and Indian Chief Standing Bear on rear of train leaving Los Angeles Depot for movie location. June 1926. The reference to a movie location is unclear; Hart made his last film ("Tumbleweeds") in 1925. Two men were known as Chief Standing Bear at the time, and their histories are sometimes conflated. This is probably the Dakota Sioux Chief Luther Standing Bear (Ohini-yan-nita-kola), who appeared with Hart in the 1921 Lambert Hillyer picture, "White Oak." He previously had an uncredited role in the 1916 Donald Crisp version of "Ramona" starring Anna Gleason. Born at Fort Robinson, Neb., in 1868, Luther Standing Bear had roles in about a dozen films in the years leading up to his death in Huntington Park in 1939. Luther Standing Bear, born Plenty Kill, was a Oglala Lakota Native American writer and actor, and on of the first students of the controversial Carlisle Indian Industrial School, in Pennsylvania. He began his entertainment career as an interpreter, dancer and horseback rider with Buffalo Bill's Wild West Show, which traveled the country at the turn of the century. From 1910 to the 1930s he starred in several Western films. He is the author of "My People the Sioux" (1928), "Land of the Spotted Eagle" (1933) and "Stories of the Sioux" (1934). Hart's first Western role was also in a stage production: in 1905, he was cast as "Cash" Hawkins in The Squaw Man. His subsequent stage roles were primarily Western and included the lead in an enormously successful production of The Virginian. Hart biography ©Friends of Hart Park • Used by permission. LW3023: 9600 dpi jpeg from 1926(?) copy print purchased 2017 by Leon Worden. Arcade Cards, Tobacco Cards, Etc.